SX-AP-4800AN2 is a dual band 802.11n wireless access point (base station) and is able to communicate with station devices (clients) supporting IEEE802.11a/b/g/n wireless networks. SX-AP-4800AN2 is ideal for business and factory environments supporting enterprise wireless security and PoE (Power over Ethernet). and 5GHz. The 5GHz band has less interference and improves connectivity with various kinds of network devices. placement of the access point. The included AC adapter is also available for power. Wireless LAN radio intensity is configurable. The radio communication distance can be lowered to allow higher security and help avoid interference. Integrated device management software "AMC Manager"
AMC Manager is an integrated device management software intended for the networking products. With the software, network administrators easily can configure, manage, and monitor Silex products connected to a wired or wireless network remotely. AMC Manager monitors status, configuration changes, firmware update, and device rebooting of Silex networking products. 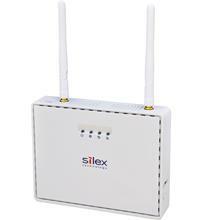 Silex transforms products into secure, reliable wireless devices and machines that deliver a completely connected, always-on experience for customers, aiming for each network device to have a reliable connection when it absolutely must connect. AMC Manager supports this vision, ensuring a healthy wireless environment with reliable remote monitoring of wireless features including RSSI value, noise level, and number of occupied DFS channels. The software is designed to be an efficient management protocol for business customers to integrate wireless infrastructure and devices.